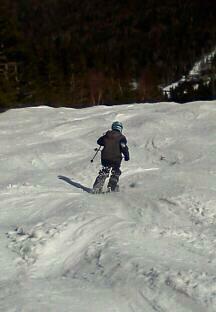 It was a great May, wait April... no mid-March spring day at Saddleback Maine. Temps soaring into the 50's after a cooler night meant great corn snow conditions at Saddleback. Corn snow is a result of repeated freeze / thaw cycles that result in a coarse wet granular snow condition. Basically while it is wet, you are able to ski and turn through it relatively well making for fun spring skiing in the sunshine. We did our best to ignore the fact that this spring season is about 3-4 weeks ahead of schedule and had a great day. We arrived a little later than usual knowing the mid-day to afternoon skiing would be best and skied from about 10-4 (good on Saddleback for keeping their lifts open an extra hour on Saturday's for the rest of the year). For the first hour or so, the snow was still a bit stiff but the temps worked their magic and corn was harvested all afternoon. 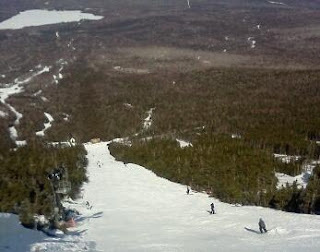 There was a nice St. Patrick's day crowd at the mountain but the lift lines were not overwhelming. Peachy's Peril Bumps were Great! For natural trails, our picks of the day were Peachy's Peril and the Intimidator Glade. Still very good coverage on these trails with sweet soft turns in the woods and Peril held some huge moguls to bounce around on. We were able to take in Burgers on the deck and the old man swilled a Saddleback Ale in the sunshine. Great day out on the mountain with the family and friends at Saddleback!